True. He had the ball in his glove as Harper was tagging 3B and still didn't even make it close at the plate. Crap, Braves just went up 2-1. We need an extra base hit. I went and got the towel back. Everyone was on Detwiler for his failing confidence a few innings back, but check out Hamels here. Couldn't quite get the big hit, but still a nice inning. Preserves a 2 run lead into the 6th. SF: "We blew it. That was our chance to get back in the game. Now we'll probably get shut down the rest of the night. We're going to have to rely on Atlanta to lose because we can't beat the Phillies. Wild card here we come!" Yeah, gives up half as many runs in his version of a meltdown. Why does carp always say cinch? 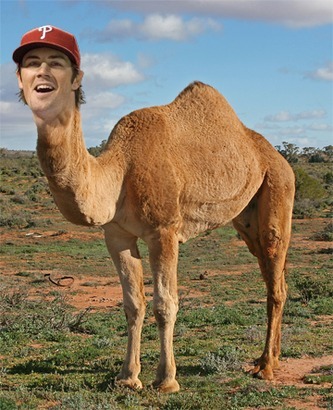 I kinda hope Hamels comes out for the next inning.